If you put them together – I am one happy girl. CLICK has done this for me and man, am I happy! I received a canister of mocha CLICK and two vanilla latte packets, a CLICK shaker and a CLICK bag to review. Immediately I noticed the little metal whisk. This little piece of metal is genius. Just put it in the shaker, add water, add CLICK, close the lid and shake! I like to add a couple of ice cubes to my CLICK while I shake it. I have even added CLICK to coconut water and it tastes fabulous. When can you drink CLICK? Anytime you want! Did you know that there have been studies done confirming that caffeine improve recovery 66% faster than a carb-only drink? This piece of information sells me on CLICK and the effects of caffeine post recovery. Now I have an even better excuse to love my coffee! I really enjoyed trying CLICK. The rich coffee chocolate flavor is one of my favorite ways to start off my day driving to school. I'm actually considering buying another canister to keep at school so I can have my after-lunch coffee pick-me-up. I've also liked the effect of CLICK prior to my running and during post-runs. If you would like to try CLICK, go to the DrinkCLICK facebook welcome page and you’ll find a Free Sample Offer and a CLICK fan discount. Also, this month, CLICK is offering free shipping on their CLICKed Out Tumbler. If you would like see some other great recipes using CLICK, check out their recipe page. Would you like the chance to win your own CLICK in mocha and vanilla latte, a CLICK shaker, and a fun CLICK bag? Enter the sweepstakes below. Giveaway ends 2/16/12. I will announce the winner on my blog on Friday, 2/17/12. I was provided CLICK to review and did not receive any further compensation. All opinions are 100% my own and were not influenced by CLICK. What a great giveaway! I actually just took advantage of the BOGO promo... but that tumblr looks amazing! I would use it as a recovery drink I think. 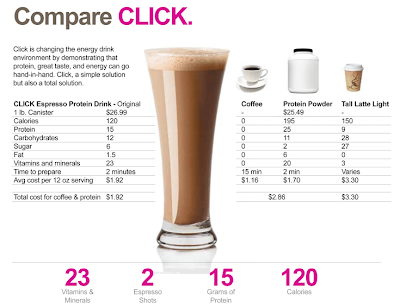 i would drink click after my runs! I drink Click when I work out in the mornings as my reward! YUM! I'd use click morning, noon and night, but would probably have to hide it from the hubs. I would try it in the mornings! I have got to try this stuff! It's right up my alley. I would use it after a good work out! Drooling. Seriously, Going to the website to find out where it's sold in Toronto(sadly it's not sold in Canada). I would use Click to replace Starbucks in the morning??? I'd use it to accompany my breakfast after a great morning workout! I'm always up for a new morning fix! I would drink it ;) haha - I hope this comment wins! I bought the sample and it was yummy!! I would love more for free for after workouts, yum! I would use Click as a recovery drink or any time really! We already love coffee drinks! I would use it to jumpstart my early mornings or in the afternoons for a yummy pick-me-up! I'd drink Click to give me energy in the mornings. I love coffee drinks. Or I might add it to my yogurt! I would drink this after my long runs and maybe for breakfast! i would use it to refuel! I love drinking CLICK for breakfast before a run. I would drink it on the run to work or before working out! I would drink this after my morning workouts! I would use it after a workout! I would drink this in the morning at the office! Better than buying coffee!